Log-to-Stats is a modern solution to get your website stats from web server log files. 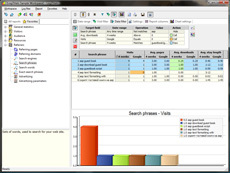 The software manages all your web log files and converts them into a statistics database. Then you can either look at your website stats using interactive and detailed reports or save them to html or other format. Log-to-Stats makes it easy to view how the stats changes over time and compare web traffic reports for different date ranges or special conditions. Absolute Log Analyzer users: get up to 50% discount when upgrading from Absolute Log Analyzer. Use your ALA product key on our support web site and find upgrade links on the product information page. Web Log Mixer is a GUI/command line utility which helps you to combine log files generated by the web server into a single log file. Source log files can be generated either by a single web server or by different web servers in the load balancing environment. The program understands log files compressed with zip, gzip or bzip2 and can compress destination log file with gzip or bzip2.